Ever dreamed of getting up close and personal with elephants? At an ethical elephant sanctuary in Chiang Mai, you'll be chilling with these gentle giants all day, learning about their lives and even bathing them. No riding, shows, and other cruelty! Arrive at the Elephant Sanctuary. Hang out and chillax with the elephants. You can also help feed them. It's time for the bathing session. Enjoy a mud spa experience together with the elephants. Change your clothes and get ready to leave the elephant sanctuary. Drop off at your hotel. One of the best one day activities in Chiang Mai, is an Elephant Sanctuary which we're offering you here. The elephant sanctuary was lovely. It was quite quiet due to the low season so I got to have a whole elephant to myself ! It did seem like they treat them well, which is something I was concerned about beforehand. May, the guide, was very pleasant and friendly! I was on the tour alone and she was great company to spend the day with and have lunch with. She had some great jokes and was very funny! Dee D made us feel like we were in good hands. She was extremely knowledgeable and assisted us as much as she could through out or whole day. As she reminded us Dee D is here for you....she was a delight to be around and made our trip so much more memorable with her humor. I strongly recommend this sanctuary as it is a once in a lifetime, experience and supports a good cause, as most of the money goes toward the elephants care. First rate experience with chanchai's family,he is an amazing chap, his knowledge is encyclopaedic and his compassion for these magnificent animals is apparent throughout. The elephants are treated as they should be,no chains,hooks or sticks anywhere and they respond accordingly. It was a real privilage to spend time with them and chanchai,nothing was too much! 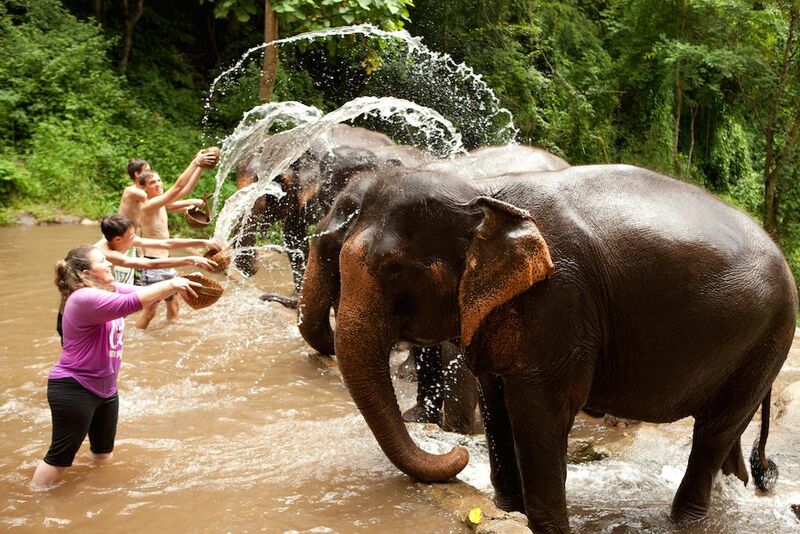 Be an Private Elephant Caretaker & Climb the Sticky Waterfall! Hug and Care for the Elephants & Enjoy a Magnificent Waterfall!